Before I started gardening, I thought I was fulfilled. However, my Experiments with Plants directly and indirectly filled voids that I hadn't even recognised, lifting my happiness to a higher level. This is a blog about a garden near London, England, and how it is changing my approach to life. During the past year I've been aspiring to a healthier lifestyle. I jumped on the bandwagon and gave up eating sugar for four months. I managed to convince myself and everyone else that I didn't need sugar - didn't even want to eat it anymore, which held true until I was confronted with a Black Forest gateau during an all-you-can-eat night-out. I was the only person on the table who had double portions. Following this lapse, I've taken a more moderate approach, allowing myself a portion of sugary food once a week - after all it's just crystallised beet juice. Another fad, which I was even less successful at, was trying to introduce fermented foods into my diet. Sauerkraut is available in my local Polish deli, but considering that I can only eat cabbage on a Friday night, the more potent version might be a step too far. However, I read about a Russian health tonic called beet kvass made from the liquor of fermented beetroots which seemed like it might be less of a shock to my digestive system. I planted some beetroot seeds, planning to make it a holistic, organic experience and bought some ingredients to practise on so I wouldn't waste my precious crop. Chunks of beetroot were left to soak in mineral water with some salt and yoghurt whey. Probiotics in the latter start the fermentation. After a few days, a scum started to develop. This is a normal part of the process which I was prepared for, but the reality of it in my kitchen was disgusting to look at, let alone contemplate drinking. The experiment was flushed down the toilet without any more excuses. In the meantime, the beetroot seedlings sprouted. Their magenta stems reminded me of the bubbling kvass. Why else would you take a photo like this? When I stopped blogging in 2013, it had become like a chore rather than my hobby - I wasn't sure why I was doing it. 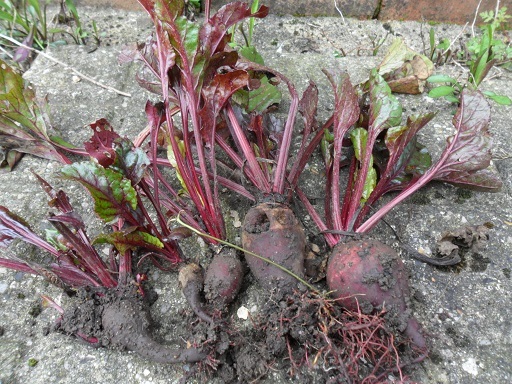 Since then, I hardly turned over the soil and beetroot plants were the only new visitors in my garden. My camera was covered in a layer of dust most of the time . Now I realise how much blogging makes me a better gardener - that's what I want to be for sure. I wondered how many of the others who started with me in 2010 were still at it. I was tempted to check if the crop was ready during the summer, but I didn't want the disappointment of digging up half-grown beetroots, so waited patiently. Finally in December, I dug up the biggest beetroot plant. It appeared to communicate a message from the underworld and certainly didn't look appetising. At a loss for words, I planted it back in its hole. I took a photo for an end-of-year post. Guess what my New Year's Resolution was? Off all the seeds that I sowed this year, which do you think survived the best ? When I plant these out, I'll think happy thoughts about borscht with a dollop of creme fraiche instead of scummy beet kvass, I'm sure it will make all the difference. Welcome back my friend.....I am ecstatic you are back as I am a better gardener with you in the blogosphere. You inspired me long ago to take risks and experiment. I was forced to a healthier lifestyle and no sugar upon my retirement.....it has taken a while but I can do it and even when I have a bit of sugar, I don't long for it after. 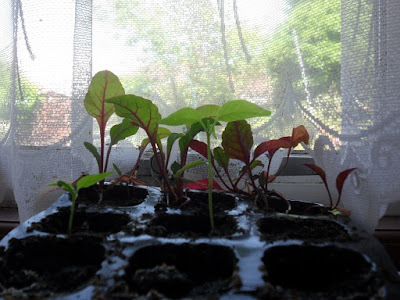 I planted my beet seeds in April and am harvesting 2-3 months later as they will go to flower if I am not careful....and it took a while to make a success of growing beets. I look forward to seeing more of your garden! The blogosphere just became a brighter place with your return and I mean that sincerely! Thanks Donna - It feels good to be back! I wish my harvest was as magnificent as yours. What about eating the beetroot leaves? Is that an option, are they edible? My mother used to cook beetroot for me. I like it BEFORE it's pickled. But sadly too messy. Welcome back, good to know that you're still gardening an experimenting. If you grow your own vegetables you will find that many are naturally sweet, particularly the root vegetables. If you need something a little sharp or sour to go with them try yoghurt, sour cream or buttermilk, balsamic vinegar, soya sauce or miso, all of which are good for your digestion. If you can cut down the refined sugar you will discover a whole new world of subtle tastes. You don't have to be too strict, after all a little treat now and then is always a good idea. So keep gardening and experimenting, and treat us to the occasional blog too. Happy you are back blogging and have taken up a healthy life in foods you choose. My setback is always sweets, but the rest I cook with fresh everything, all healthy. I love cooking so my experimentation is cooking, always love fresh picked fruit and vegetables, even from local farms. None in the garden except herbs this years, but where would cooking be without herbs. Yay! I am so glad that you're back! I was a little worried about you, and with good cause, apparently -- brewing your own kvass and that. You are a brave soul, and a wise one. Your beets are lovely from seedling to harvest and will make delicious borscht. Creme fraiche is fermented, isn't it? Reading this post has been the best thing to happen all week. Welcome back! Thanks Diana - I see you've been busy in your new garden. I feel a bit uncomfortable about eating beetroot leaves after the slugs have had their share. On the other hand, I'm a fan of pickled beetroot. In the UK, they're advertised as "dipped in vinegar", which I feel makes them a bit more sophisticated. You must be missing your mum, I miss the things my mum used to cook for me too. Thanks Christine - I remember how you grew vegetables sheltered against the strong winds and I've tried miso broth with vegetables, it's really tasty. The biggest problem with giving up sugar is finding foods to snack on when I'm not at home. Some days I'm organised and take fruit, nuts and crackers but on the other days I try to pick the healthiest chocolate bar in the vending machine. Thanks Donna - I remember your recipes, especially your pumpkin pie. Yum! Thanks Stacey - yes, creme fraiche is fermented! (though I've never seen it with probiotics added). Oh! I tried growing beets and this vegetable is like a royal one -- you need to water it so that the roots (beets) don't become strong and tough; but again too much water will kill it. The soil has to be perfect -- loose and full of organic matter. It needs morning sun but afternoon shade; if temperature is above 80F, it will bolt; it will not grow if it is below 50...and whatever not...a really tough vegetable to grow. Oh! did I mention about the fertilizers. Too much and it will be all leafy. Too little and the beets are not like the beets that we see in markets. But I think we gardeners are eternal optimists. And, thus again I will grow them this year. Your posts are wonderfully eccentric. I was reminded of you when I followed up an old comment you made on my blog! Good Luck with your beetroots KL. I've given up! Thanks Phillip. The beetroot with the ghostly eyes put me off unfortunately. Thanks Roger, You've motivated me to write a post! I work as an engineer (though I prefer to call myself a scientist). One of my favourite children's books was The Secret Garden and now I have my own ............... It was tempting to buy new plants to fill the flower beds and create an impressive display, but that would have been too easy. Instead my back garden, where most of these photos are taken, is a work-in-progress of my experiments with plants. The Stories of Trees | Bending. Adapting. Enduring. The owner is not responsible for the republishing of the content found on this blog on other Web sites or media without permission. All content provided in this blog is for informational purposes only. The owner of this blog makes no representations as to the accuracy or completeness of any information on this site or found by following any link on this site. The owner will not be liable for any errors or omissions in this information nor for the availability of this information. The owner will not be liable for any losses, injuries, or damages from the display or use of this information.